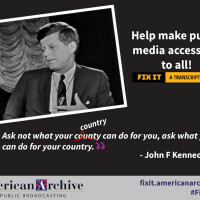 A crowdsourcing project promises to demonstrate that when it comes to providing access to audiovisual archives, not only users with visual or hearing disabilities benefit. All users may. Nothing brings civic attitudes into sharper relief than a civil-rights test case. It doesn’t have to be about race — a case about the rights of people with disabilities serves just as well. Take the curious matter of the “disappearing” University of California at Berkeley videos.